1. 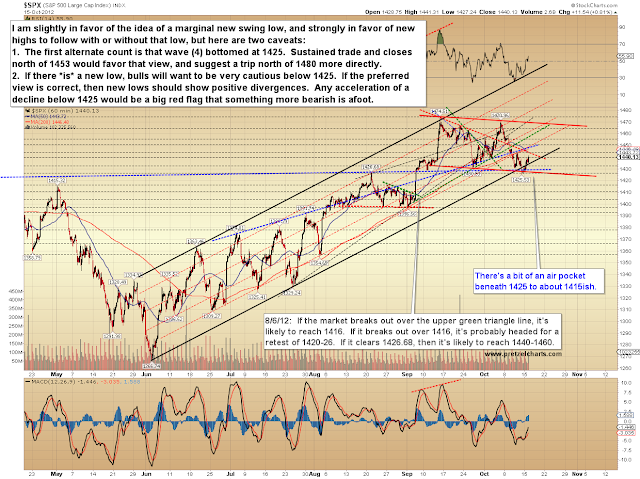 On the longer time frames, the preferred view is that new swing highs north of 1480 will be made, one way or another. There are several more bearish alternate wave counts, but currently these appear to be long-shots; thus they will be discussed in more detail only if the market dictates. 2. On the shorter time frames, I'm slightly favoring the view that a new swing low (with a current target in the 1410-1420 SPX zone) will be made before the "final" low is in place and the market rallies beyond 1480. 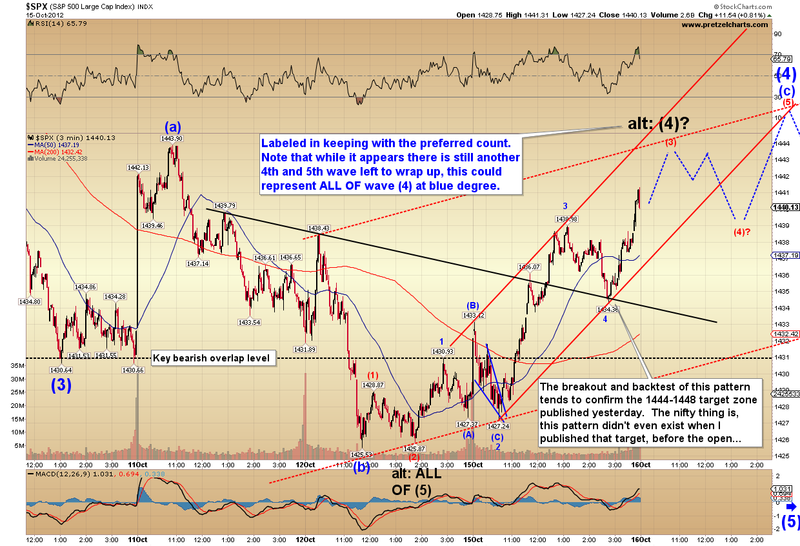 The first alternate short-term wave count is that the low is in place already, at SPX 1425. 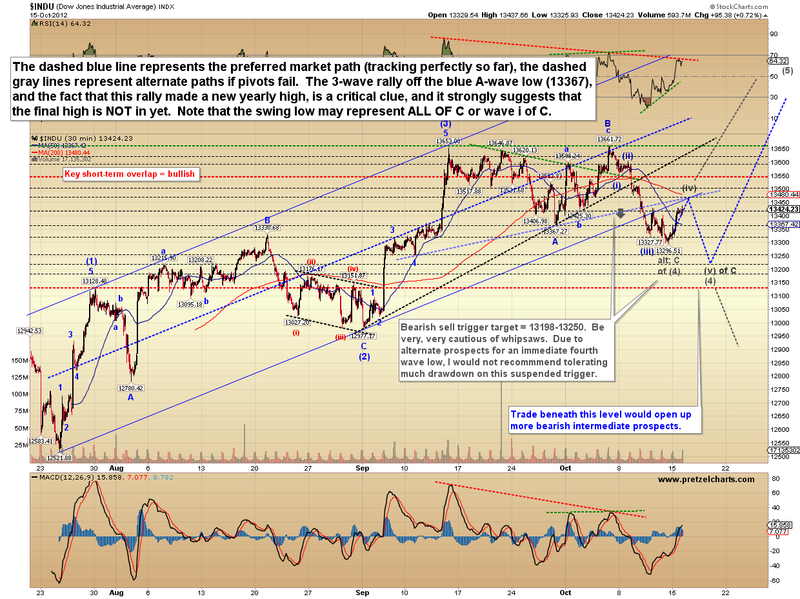 Yesterday's projected turn off the low is now in place. Since the preferred outlook is tracking very well across all time frames right now, there's no reason to alter any portion of it just yet. The Dow Jones Industrials (INDU) shows the preferred short-term and intermediate term paths at larger scale. If the wave counts are correct at all degrees, then SPX is expected to travel a similar route -- and again, the main question is still whether an intermediate low is now in place, or whether a new swing low will be made first. 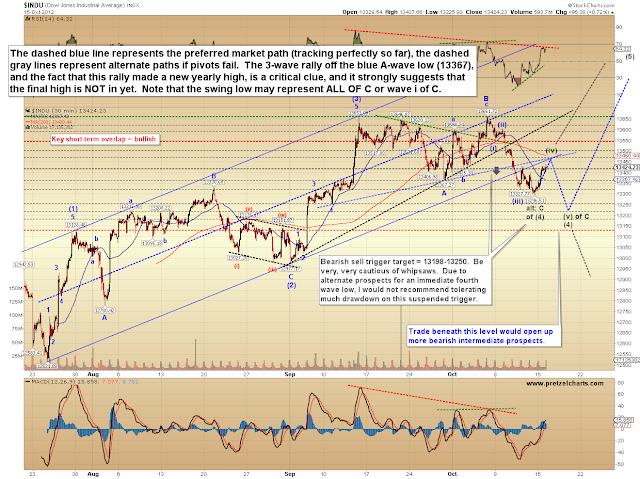 The SPX chart below discusses the caveats and warnings which are applicable to each time frame. And finally, an attempt to project the short-term path in painful detail. 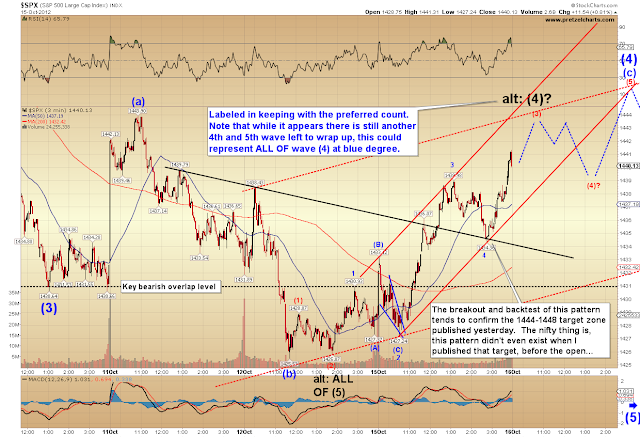 Note that this particular chart only examines the short-term option of wave (c) of (4). 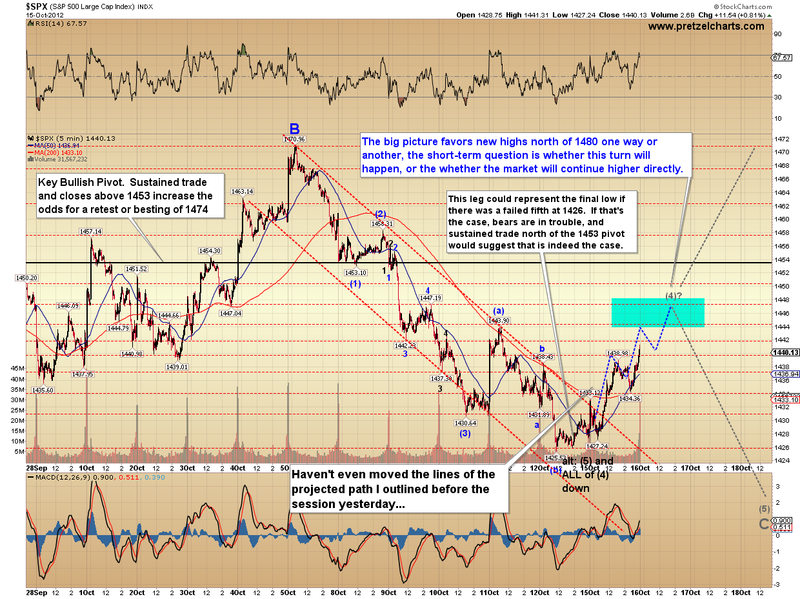 A marked deviation from this path would suggest the other options as discussed. In conclusion, the big picture outlook has remained unchanged for about a month, and still expects new swing highs beyond 1480. 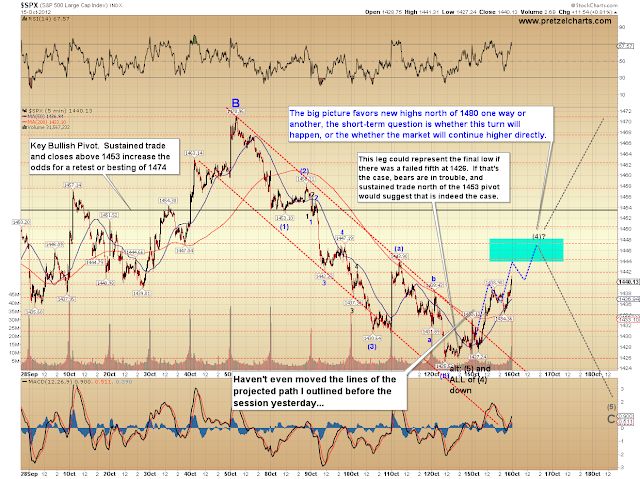 The short-term outlook captured the recent bottom near 1425, and the market now appears poised to capture my first target zone of 1444-1448. 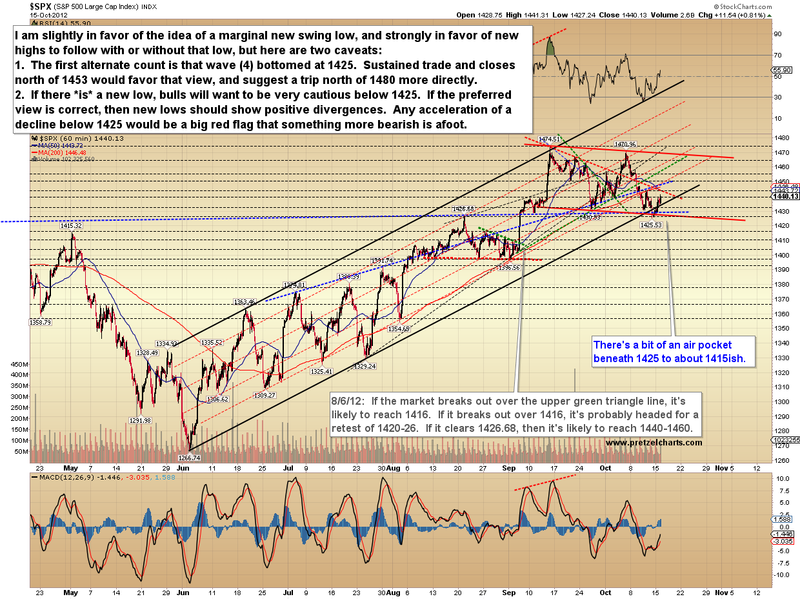 Over the next few sessions, we'll gain additional insight about whether the 1425 low will hold for the intermediate term or not. Trade safe. Good day, Pretz! I hope I'm following the instructions correctly here. I've applied for an account on the daily discussion forums with the new username "Bengal." 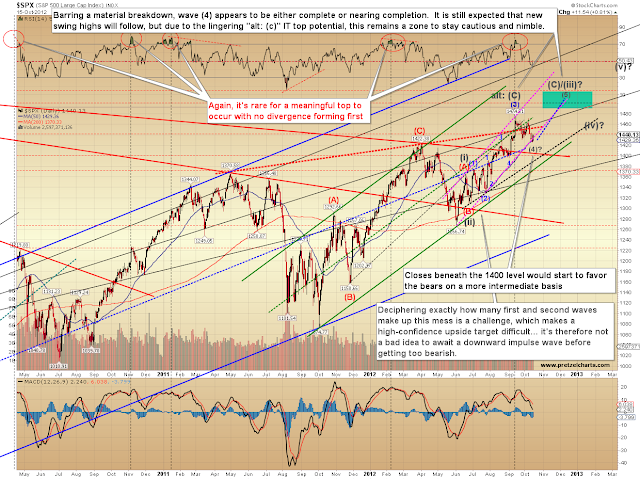 I've posted here (and contributed) a couple of times in the past ... let's call it, oh, about a year ago, Nov-Dec 2011 timeframe. I'd be grateful for approval of new account. Many thanks. Ben Richter.